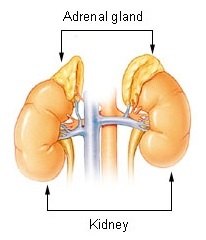 ↑ "FeedBack What Is Adrenal Gland? Adrenal Gland Diseases". OrgansOfTheBody. Retrieved 2013-09-17. Anatomy Atlases - Microscopic Anatomy, plate 15.292 - "Adrenal Gland"
SUNY Labs 40:03-0105 - "Posterior Abdominal Wall: The Retroperitoneal Fat and Suprarenal Glands"